14 Dec. 2015 cover of the New Yorker, by Eric Drooker. 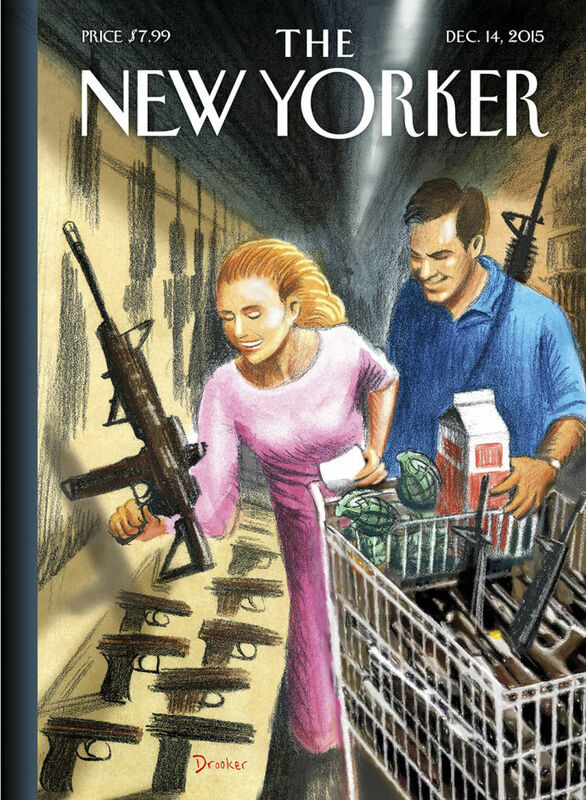 Is there anything left to say about America’s self-destructive passion for firearms? Yet I think we have crossed a line into utter madness. When it comes down to the daily barrage of mass murder, what I believe is that we have turned our country over to terrorists of every religious stripe and no religion at all. The latest murderers may very well have been inspired by ISIS. But last week’s murderer in Colorado Springs was clearly inspired by the violent rhetoric of the Christianist far right, including the rhetoric of some of the Republican candidates for president. This cannot go on any longer. I am full of rage at the cowardly politicians who are so easily bullied by the NRA and so unwilling to listen to the majority of Americans who want some actual gun control laws to be enacted in this country.